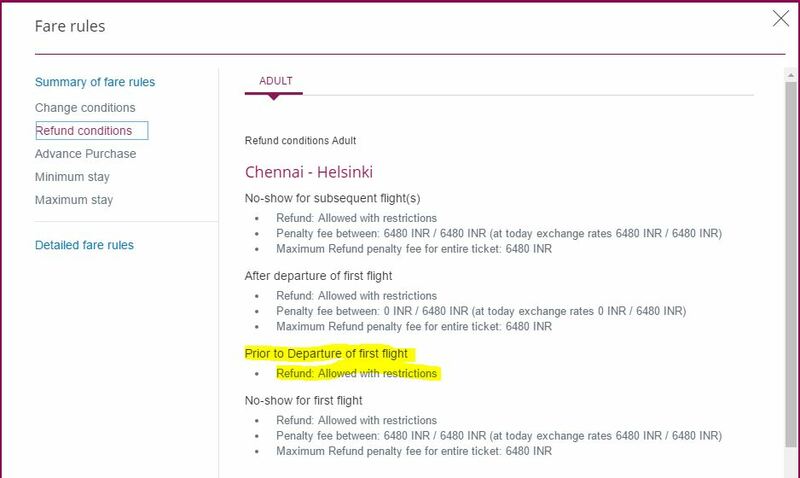 I am looking to book a ticket with refund for cancellation and trying to identify the most the one which gives most of the amount as refund if not all. I noticed that Qatar airways Economy Flexi is offering cancellation free of charge. What does it mean if I cancel the entire ticket couple of days before the departure without using any of the flights booked - first and subsequent flight? Do they refund the whole amount without even any fee/penalty? THE ORIGINAL AND THE REISSUED TICKET MUST BE ANNOTATED - NON END/CHNG PENALTIES - AND - AS PER RULE - IN THE ENDORSEMENT BOX. >       APPLICABLE FARE FOR TRAVEL ON FRI/SAT/SUN. >           ALL SURCHARGES MENTIONED ACCRUE TO QR ONLY. >             ADDED TO THE APPLICABLE FARE FOR TRAVEL. >           ALL SURCHARGE MENTIONED ACCRUE TO QR ONLY. >     FARE FOR TRAVEL ON FRI/SAT/SUN. > APPLICABLE FARE FOR TRAVEL FROM 10APR 17 THROUGH   24APR 17. CHARGE USD 55.00 FOR NO-SHOW. IN THE E-TICKET WILL BE CONSIDERED AS A NO-SHOW. THE CHANGE FEE APPLIES PER FARE COMPONENT. WILL NOT APPLY FOR INFANT NOT OCCUPYING A SEAT. THE MOST RESTRICTED FARE WILL APPLY. THE ORIGINAL FORM OF PAYMENT. WITHIN 364 DAYS OF ORIGINAL TICKET ISSUE. AMOUNT AMONG ALL THE REISSUED FARE WILL APPLY. Where do I find exact cancellation fee for this type of ticket? I am quite sure there is a fee which is lying somewhere! Thank you. Qatar Airways Flexi fares can be changed, canceled, and are fully refundable in all three classes (First, Business, and Economy, if done no less than 3 hours prior to the scheduled flight departure. After that, it is considered a no-show and a fee imposed. Enjoy greater choice with our updated fare families. The new structure offers consistent and easy to understand travel options across cabins allowing you greater flexibility to choose fares that match your preferences and travel budgets. 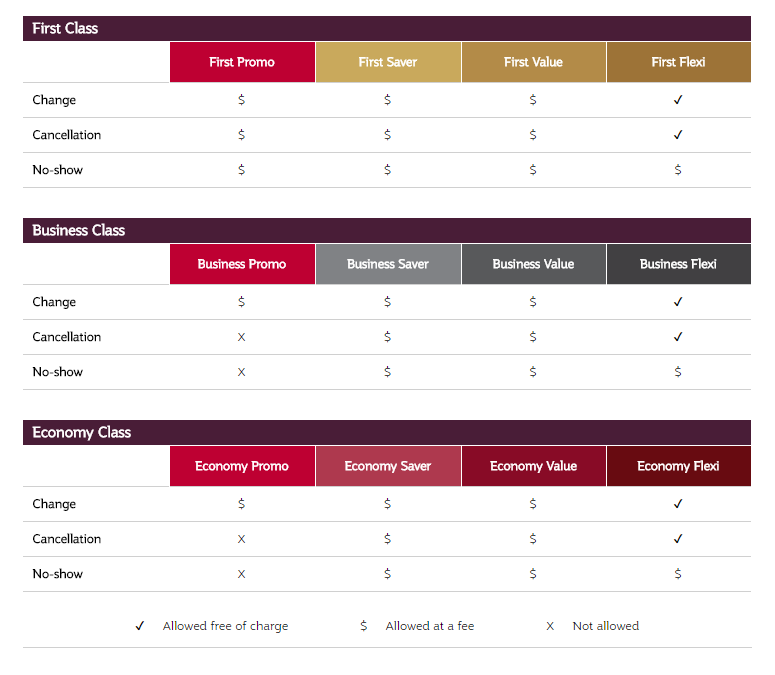 The tables below display a summary of the fare family conditions across First, Business and Economy Class. This summary is for reference only. Fare conditions may vary on some destinations. Please refer to the detailed fare rules which are displayed when you search for flights during the booking process. Not the answer you're looking for? Browse other questions tagged cancellations qatar-airways or ask your own question.